And why his exit may be a bad sign for Marco Rubio. Louisiana Gov. Bobby Jindal addresses the Sunshine Summit in Orlando on Saturday. Louisiana Gov. Bobby Jindal on Tuesday evening became the third governor (current or former) to drop out of the Republican primary race for president. It’s not exactly surprising; he had raised little money and never went very far in the polls. Still, Jindal’s inability to catch on, like that of the other two Republicans to drop out so far — Rick Perry and Scott Walker — shows that candidates who try to appeal to both the establishment and a more conservative part of the party may be stretching themselves too thin. 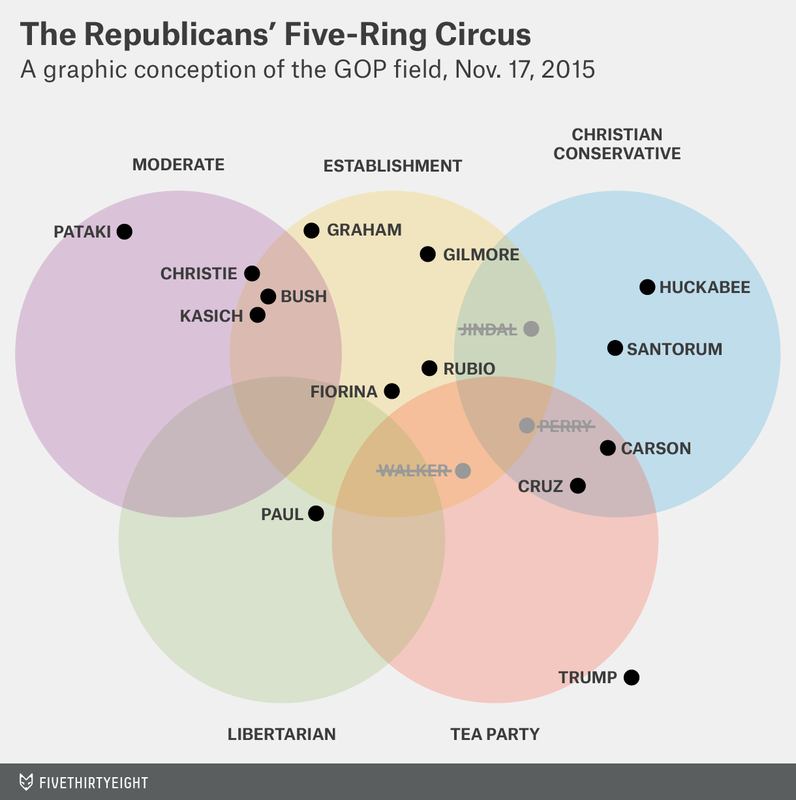 Here’s our updated five-ring circus chart, a graphical view of the 2016 field and the five factions of the Republican Party. Jindal was best known as a policy wonk before this campaign, but he tried to merge that wonkiness with hard-core conservatism. He ended up with one foot in the Christian conservative camp and one in the establishment wing of the party. What did that get him? A high net-favorability rating in Iowa (where he visited frequently), but little else. If you try to please everyone, you risk pleasing no one. Perry and Walker had similar problems. Perry had ties to the tea party, but also tried to appeal to the establishment, following his disastrous 2012 run. Walker, on the other hand, struggled with subjects outside his economic wheelhouse. There were better establishment candidates (with less baggage in Perry’s case and better political skills in Walker’s) and purer tea party/outsider candidates. Jindal, Perry and Walker’s struggles reflect the unusual nature of a now 14-candidate Republican field: At this stage, it may be better to be the first choice of a medium number of voters than the second or third choice of a lot of voters. In the past, winning candidates appealed to multiple wings of the party. George W. Bush did well with the establishment and Christian conservatives in 2000. John McCain did well with the establishment and moderates in 2008. At this point in the campaign, 2016 voters have so many choices that they don’t need to settle. They can choose the candidate who best reflects their ideological preference. Voters looking for a clean break from the establishment, for example, can choose someone like Ben Carson, Ted Cruz or Donald Trump. That’s potentially a dangerous sign for Marco Rubio, a candidate who supposedly appeals to multiple parts of the party. Rubio continues to be the favorite of most analysts to win the nomination (including yours truly) because he is conservative enough to appeal to the right wing, but enough of an establishment figure to satisfy the old guard as well. It’s part of the reason that he has such strong net favorability ratings. Yet, Rubio continues not to do particularly well on the ballot test. So is Jindal’s failure proof having it both ways won’t work in 2016? It’s hard to say. Simply put, this primary (still) has a lot of candidates and Republican voters remain volatile; with so many variables in the equation, the potential for chaos — or at the least, disarray — is high.